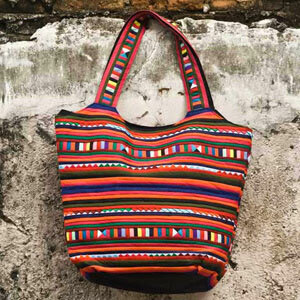 A vibrant shoulder bag handmade by Issaraporn Saeyang. 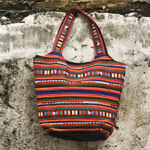 The exterior features row upon row of multicolored stripes appliquéd in the Lisu fashion. 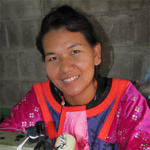 Artisan Issaraporn lines the interior with polyester and adds a small pocket in the inside. The bag closes with a zipper.